1. 4 large heads iceberg lettuce. 2. 5 fresh tomatoes, medium size, sliced. 3. 2 9 inch cucumbers, scored, sliced. 4. 4 onions, medium size, sliced (6 to 7 slices each). 5. 4 green peppers, seeded, sliced into rings (6 to 7 rings each). 6. 25 leaves, leaf lettuce. 1. Clean, core and cut the iceberg lettuce into wedges, 6 to 7 wedges must be cut from each head. 2. 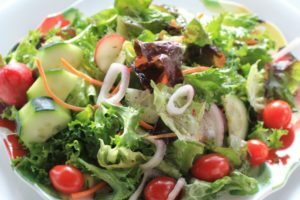 Line each cold salad plate with a leaf of lettuce. Place a wedge of head lettuce on top. 3. Lean a slice of tomato and a slice of onion against the wedge of lettuce. 4. Lean two slices of cucumber against the tomato and follow with a ring of green pepper. 5. Garnish with a sprig of parsley and serve with an appropriate dressing. 1. 25 fresh tomatoes, medium size, peeled. 2. 1/4 cup chives, minced. 3. 1/4 cup radishes, minced. 4. 3 pounds cottage cheese. 5. 4 heads iceberg lettuce, shredded. 7. 25 parsley or water cress sprigs. 1. Place the tomatoes in hot water. Allow to set until skin becomes slightly loose. Remove, peel and cut out core of tomato. 2. Cut a slice off the top of each tomato and hollow out the center. Save pulp for use in some other preparation, such as soup or stew. 3. Place the cottage cheese in a mixing container. Add the minced chives and radishes, mix thoroughly. 5. 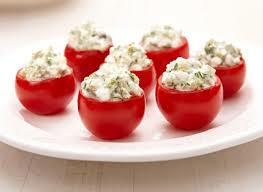 Place a hollowed out tomato in the center of each plate. Fill the cavity with the cottage cheese mixture. 6. Garnish with a sprig of watercress or parsley.